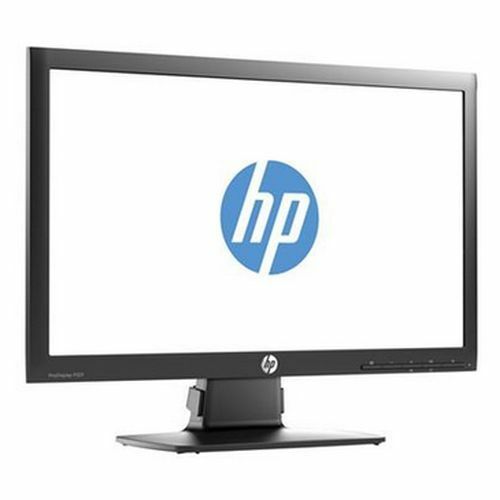 Keep up the good work with solid performance, a stylish design, and environmental features all at an attractive price point with the HP ProDisplay P201 50,8 cm (20') LED Backlit Monitor. Efficiently grow and maintain your business with proven HP quality and reliability, stable lifecycles, HP accessory compatibility, and energy savings. Do more throughout the day and help save more throughout the quarter with a monitor that goes the distance. Support your business needs wherever you need a solid performing monitor at a competitive price with a 50,8 cm (20') diagonal LED business display. See the difference with an LED display for vibrant text and graphics presentation. LED technology also makes your display thin, light, and easy to position on the desk. Deliver clear views for single and multiple users with wide viewing angles. High contrast ratios and fast response times keep your content crisp and readable throughout the day1. Work comfortably with up to 30 degrees of tilt on the adjustable design, and easily connect to devices with convenient VGA and DVI inputs. The internal power supply minimizes clutter on the desktop and simplifies setup and deployment. Customize your work space with options like the HP Quick Release, HP Speaker Bar and HP USB Graphics Adapter (options sold separately). Free up valuable space and lift the monitor completely off the desk. The 100-mm standard VESA pattern allows mounting on a HP Monitor Arm, HP Stand, the HP Quick Release and other VESA-compatible accessories (options sold separately). Maintain product consistency across staggered deployments, ease transitions and help reduce support costs with a minimum one-year lifecycle stability commitment from HP. Support identical installations and unify your operations worldwide with globally consistent products in over 145 countries. Rest assured that your IT investment is supported by a standard, three-year limited warranty. Select HP Care Pack Services2 to extend service contracts beyond the standard warranties. HP Display Assistant consolidates monitor setting controls into one easy-to-use, centralized interface. Customize your workspace with resizable screen partitions that let you work on a document in one partition, refer to a spreadsheet in another, and check e-mails3 in another—at the same time. Use the new expanded toolbar to view the applications you’re using across all of your connected displays. Mercury-Free LED backlighting, a BFR/PVC-free design4, and arsenic-free display glass5 are just a few of the environmental features built into this display.